In this issue, Stavrou et al. pursue coagulation factor FXII’s functions in neutrophil-mediated inflammation during wound healing. 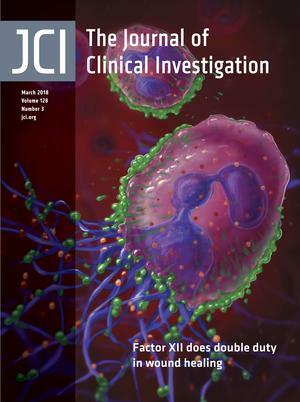 The cover image depicts translocation of FXII (green) to the plasma membrane of activated neutrophils, where it acts as an autocrine signal to enhance neutrophil adhesion, migration, chemotaxis, and NET formation (purple lines). Image credit: Erika Woodrum. Citation Information: J Clin Invest. 2018;128(3):891-892. https://doi.org/10.1172/JCI99905. Citation Information: J Clin Invest. 2018;128(3):893-896. https://doi.org/10.1172/JCI99820. Citation Information: J Clin Invest. 2018;128(3):900-902. https://doi.org/10.1172/JCI99725. Citation Information: J Clin Invest. 2018;128(3):903-905. https://doi.org/10.1172/JCI99799. Citation Information: J Clin Invest. 2018;128(3):906-909. https://doi.org/10.1172/JCI99726. Asthma is remarkably heterogeneous, and there are multiple underlying inflammatory pathways and structural airway abnormalities that lead to symptomatic disease. Consequently, a current challenge in the field is to precisely characterize different types of asthma, with the goal of developing personalized approaches to therapy. In the current issue of the JCI, Dunican et al. developed a noninvasive way to assess airway dysfunction in asthma by measuring mucus accumulation using multidetector computed tomography (MDCT) and found that mucus plugging of small airways was remarkably common in subjects with severe asthma. This work highlights the importance of noninvasive imaging approaches in defining specific asthma subsets and guiding targeted therapies. Citation Information: J Clin Invest. 2018;128(3):910-912. https://doi.org/10.1172/JCI120123. Citation Information: J Clin Invest. 2018;128(3):944-959. https://doi.org/10.1172/JCI92880. Citation Information: J Clin Invest. 2018;128(3):960-969. https://doi.org/10.1172/JCI97007. Citation Information: J Clin Invest. 2018;128(3):997-1009. https://doi.org/10.1172/JCI95693. Citation Information: J Clin Invest. 2018;128(3):1043-1056. https://doi.org/10.1172/JCI94996. Citation Information: J Clin Invest. 2018;128(3):1141-1153. https://doi.org/10.1172/JCI94999.